Ve, Perro. Ve! : Go, Dog. Go! 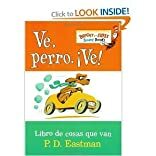 (Bright & Early Board Books(TM)) (Spanish Edition) [Board book] was written by P.D. Eastman.